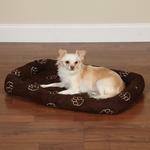 Give your pet a comfortable space of their own with our Slumber Pet Embroidered Paw Print Crate Dog Bed in Chocolate. Extra soft, comfy and designed to fit most of our dog crates, this Slumber Pet Embroidered Paw Print Crate Mat Dog Bed matches one of our most popular car seat cover (sold separately). Durable and superior quality ultra suede polyester design features an embroidered paw print pattern, bolstered sides and a non-slip nylon bottom. Machine washable for easy care. Small measures 23 3/4"L x 16 3/4"W; Fits crates 24" x 17"
Medium measures 29 3/4" x 18 3/4"; Fits Crates 30" x 19"
Medium/Large measures 35 3/4" x 22 3/4"; Fits Crates 36" x 23"
Large measures 41 3/4" x 27 3/4"; Fits Crates 42" x 28"
X-Large measures 47 3/4" x 29 3/4"; Fits Crates 48" x 30"
I was looking for an outfit for my dog for the Scottish Day Parade in Alexandria VA in December and easily found it here.